When hunger strikes, we often find ourselves reaching for a snack to fill in the gaps. Top tip? 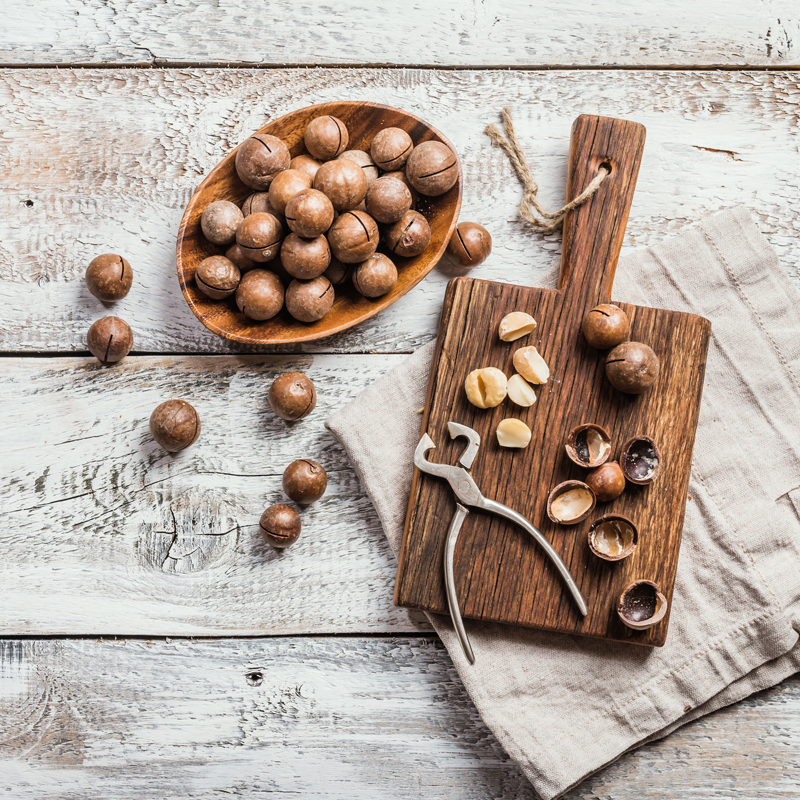 If your snack contains nutrient-packed nuts, you’ll find you feel fuller and fuelled for longer. This is one of the easiest snacks to make, because it really only involves mixing whatever ingredients you want! Plus, it can be prepared in large batches – so you can always have it on hand. In a large bowl combine a selection of nuts, such as almonds, pistachios, peanut, cashews or walnuts. Top tip: you can use toasted nuts if you prefer, but whether raw or roasted they should be unsalted and unsweetened. Add in some sesame, pumpkin, flax or sunflower seeds for an extra boost of nutrition. Dried fruits such as cranberries, apricots or banana chips add some interest and sweetness, but you can also add dried coconut flakes or some grains such as cereal, toasted oats or shredded wheat. What do you get when you cross chocolate truffles with nut bars? These delicious bliss balls. The secret to this trendy treat is adding just enough chocolate and sweet stuff to trick your brain into thinking you’re having a delicious dessert, but balancing it out with healthier ingredients that will actually help to fuel you up. You can mix up the below recipe any way you like, adding dried fruit, protein powder or even fresh fruits to give it a new spin. 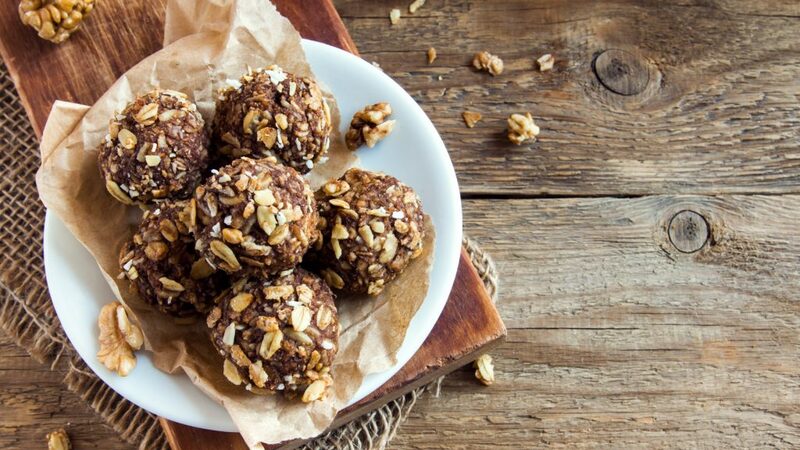 To make this delicious take on bliss balls, start with one cup of nuts, such as almonds, cashews, walnuts or peanuts, and place them in a food processor, pulsing twice to pre-crush the nuts. Add 3 tablespoons of cocoa powder, 1 tablespoon of your favourite nut-butter (such as hazelnut or peanut butter) and 5 pitted dates. Blend until it forms a paste. Scoop out 1 tablespoon at a time and roll into a ball with wet hands. Roll in flaked or desiccated coconut for that rum-ball looking exterior. A great muesli bar will be your saving grace if you need something to tide you over until dinner or a quick burst of energy in the afternoon. These muesli bar bites can be teamed with fresh fruit or yogurt to help you get even more out of your snack. Stir to combine the dry ingredients, adding a pinch of cinnamon and ¼ cup brown sugar if you want more sweetness and warmth. Stir through 100g melted butter and ¼ cup of peanut butter until all the ingredients are moist. Press your mixture into a rectangular baking dish and bake for 30 minutes or until the edges are golden. Allow to cool completely in the pan before cutting into bite-sized slices with a warm knife. You can update this recipe by drizzling melted chocolate across the bars while they cool, adding spice to suit your tastes and mixing up your fruit and nut combinations. Who says granola is just for breakfast? This granola recipe makes a great high-energy snack throughout the day. The best thing about it is that not only is it completely fool-proof, but using a simple formula you can make it with pretty much any ingredients you desire! and a teaspoon of salt. From there you can add up to a cup each seeds (such as pepitas), flaked coconut, dried fruit (best to add after baking), spices (such as cinnamon, nutmeg or even ginger) and even chocolate chips. Simply combine all your ingredients in a bowl (mix dry together first, then add wet ingredients) then spread out in a single layer on a baking sheet. Bake at 140°C CircoTherm® for 45 minutes, stirring every 15 minutes to break up the granola. Allow to cool, then store in an airtight container.